Apoquel tablets are novel treatment used to treat and control pruritus (itching) associated with allergic dermatitis; also to treat and control atopic dermatitis, in dogs at least 12 months of age. Atopic dermatitis is a chronic inflammatory skin condition that is a common condition in dogs and is triggered by an allergic reaction to a variety of allergens. These include fleas, house dust mites, mould, grass, pollen, chemicals such as pesticides or shampoo, and food allergy. Symptoms that your dog is suffering from itching due to allergic dermatitis include frequent licking, biting and scratching to relieve the itch; excessive rolling; recurrent ear problems including head shaking, ear discharge, ear odour, scratching at the ears; changes in the skin such as rash, redness and scab formation; loss of hair; body odour. Unless these symptoms are relieved, a cycle of irritation can develop whereby the more your dog scratches and rubs to try and relieve the itch, the more the skin becomes sensitised and inflamed, which triggers more itching. Apoquel tablets are fast acting to provide rapid relief from itching while the cause of the itching is investigated, but the effect is short lived to allow for testing of possible causes during diagnosis. Apoquel tablets are safe for long term use and in conjunction with other medications including non-steroidal anti-inflammatory drugs (NSADIs) anti-infective drugs, antifungals, antiparasitic drugs and allergen-specific immunotherapy or desensitisation therapy. 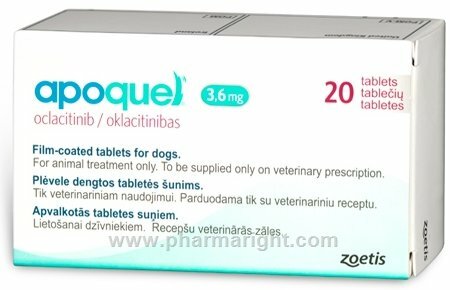 Apoquel tablets contain oclacitinib, a novel inhibitor of the Janus Kinase enzyme system (JAK) that is used specifically to treat allergic dermatitis in dogs. The JAK system describes a series of non-receptor tyrosine kinases enzymes that inhibit specific cytokines, which are small proteins acting as messengers between cells and are involved in many cellular processes. A tyrosine kinase is an enzyme that phosphorylates proteins (add a phosphate group) and most tyrosine kinases are cell surface receptors. However, the JAK enzymes are activated by the binding of a specific cytokine to its cell surface receptor and this activates the JAK enzyme which triggers an intracellular cell signalling pathway. The JAK enzyme system comprises four enzymes and oclacitinib in Apoquel tablets is most effective against JAK1, which is the enzyme that is activated by a series of cytokines known as interleukins (IL), specifically IL-2, IL-3, IL-6 and IL-13 that are involved in the allergic response and inflammatory process; also IL-31, which is associated with the itching response. Oclacitinib in Apoquel tablets specifically inhibit JAK1 activation by these cytokines and has little effect on the other JAK enzymes involved in the immune system including immunoregulatory and haematopoiesis (formation of blood cells in the bone marrow) functions1. Steroids are often used to treat pruritus in dogs as they provide effective and rapid relief, however, they can also cause some unpleasant short and long term side effects. Oclacitinib in Apoquel tablets is not a steroid and works through a novel mechanism to relieve itching with comparable efficacy but without the usual side effects associated with steroids2. Apoquel tablets are fast acting providing relief from itching within four hours, with controlled itching within 24 hours, which can be maintained for several weeks while a the cause of the itching is investigated and a diagnosis is made. Apoquel tablets contain the active ingredient oclacitinib, an inhibitor of the Janus Kinase enzyme system (JAK) that is used specifically to treat allergic dermatitis in dogs to relieve itching. Apoquel tablets contain oclacitinib, a novel inhibitor of the Janus Kinase enzyme system (JAK) that is used specifically to treat and control pruritus (itching) due to allergic and atopic dermatitis in dogs. Atopic dermatitis is a chronic inflammatory skin condition that is a common condition in dogs and is triggered by an allergic reaction to a variety of allergens, including fleas, house dust mites, mould, grass, pollen, chemicals such as pesticides or shampoo, and food allergy. Symptoms that your dog is suffering from itching due to allergic dermatitis include licking biting, scratching, rolling, recurrent ear problems, skin rash, scab formation, hair loss and body odour. Unless relieved, a cycle of irritation can develop whereby the more your dog scratches and rubs to try and relieve the itch, the more the skin becomes sensitised and inflamed, which triggers more itching. Oclacitinib in Apoquel tablets specifically inhibits the JAK1 enzyme that is activated by a series of cytokines known as interleukins (IL), specifically those that are involved in the allergic response and inflammatory process. Apoquel tablets are fast acting to provide rapid relief from itching while the cause of the itching is investigated, but the effect is short lived to allow for testing of possible causes during diagnosis. What are the side effects of Apoquel? The most commonly reported side effects when your dog is taking Apoquel tablets include vomiting and diarrhoea, anorexia, and lethargy, which is resolved in most cases. When should Apoquel not be used? How should Apoquel be given? You should give your Apoquel tablets to your dog twice daily for up to 14 days and then once daily for maintenance treatment. The dose given depends on the weight of your dog and should be 0.18 to 0.27 mg/lb or 0.4 to 0.6 mg/kg. You can give Apoquel tablets to your dog with or without food. You should continue to give Apoquel tablets to your dog for as long as recommended by your veterinary professional and until the cause of the itching has been resolved. How long should give take Apoquel? You should continue to give Apoquel tablets to your dog for as long as recommended by your veterinary professional and until the cause of the itching has been resolved. If you miss a dose of Apoquel tablets give it as soon as you remember, unless it is time for your dog to take the next dose, then skip the missed dose. Do not give a double dose. How should Apoquel be stored? You should store your Apoquel tablets below 25°C in a cool dry place. Gonzales AJ, Bowman JW, Fici GJ, et al. Oclacitinib (APOQUEL®) is a novel Janus kinase inhibitor with activity against cytokines involved in allergy. J Vet Pharmacol Ther. 2014;37:317–324.